Size and type of your bunk bed. For two small children, a twin bed on top of a twin bed works nicely, but for one younger and one older child, you might want to get a twin over full bunk bed. A twin bed over a futon creates the perfect place to hang out or invite friends to stay overnight. Bunk bed wood type. You may want to match the bunk bed to other furniture in your child's room, or you may be looking for something that is solid wood versus a manufactured wood. Bunk beds that separate. 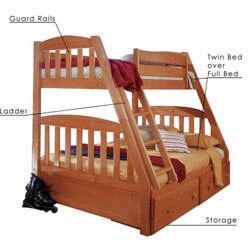 Some bunk beds can convert into two beds, which is an ideal feature as children grow up and bedding needs change. Storage drawers and trundle drawers. These provide extra room for belongings or for a trundle bed, and cut down on under-the-bed messes. Bunkie Boards. You can ensure level support throughout your child's bed with a bunkie board, a flat, wooden platform that supports the mattress, much like a box spring supports a regular bed. Some bunk beds include bunkie boards, and sometimes bunkie boards are available for purchase as an accessory to the bunk bed. Slat kits. These can be used as an economical alternative to bunkie boards or box springs. Slat kits, which are basic strips of board, support the mattress but have gaps in the support. Some bunk beds already include slat kits. Maple is an extremely hard, fine-textured wood. The color is light although some maple has a reddish cast. It can also be stained to simulate cherry wood, which has similar grain. Oak is a strong, hard-wearing wood with a pronounced texture. Oak is especially associated with Mission-style furniture. This type of wood tends to be heavy and durable. Cherry is a moderately hard and sturdy wood with a reddish-brown tone and tight, straight grain. Cherry resists warping and is easy to work with so is sometimes used for more decorative furniture. Hardwood refers to a selection of various hardwoods. Hardwood beds are more durable than beds made from pine, but the exact type of wood that is used can vary. Oftentimes, in the furniture industry, "hardwood" refers to Asian hardwoods, such as rubberwood. Pine is a soft wood with a knotted look. Pine tends to dent easily, although it will still hold together well. Many times this wood is used to create a rustic or antique look for furniture. What are trundles, and how do they work? A trundle is a bed that can be rolled out from underneath an existing bed, typically on a drawer. Trundles are usually used as spare beds. For any bunk bed with a trundle, the trundle mattress height should not exceed eight inches. If a mattress larger than this is put on the trundle drawer, the trundle may not fit under the bed. Equipped with this information, you'll be sure to find a bunk bed that's perfect for your home and lifestyle.